1.1 Payment and ownership structures between financial advisers2 and product providers have become increasingly complex and diverse. Investors are often not fully aware of the existence, nature or implications of these payment or ownership structures. Commercial arrangements between financial advisers and product providers may also give rise to issues relating to the independence of financial advisers. 1.2 Some financial advisers may wish to use the word “independent” in their business names or in respect of their advice or recommendation. They may also wish to promote or advertise their services as being “independent”. However, the use of the word “independent” by a financial adviser has strong connotations for the investing public. It suggests to the investor that the financial adviser operates with objectivity and impartiality, and does not have any potential conflicts of interest when recommending an investment product as a result of commercial or financial links with a product provider. In the light of such public expectations, the Financial Advisers Regulations (“FAR”) limit the use of the word ‘‘independent’’ by financial advisers. 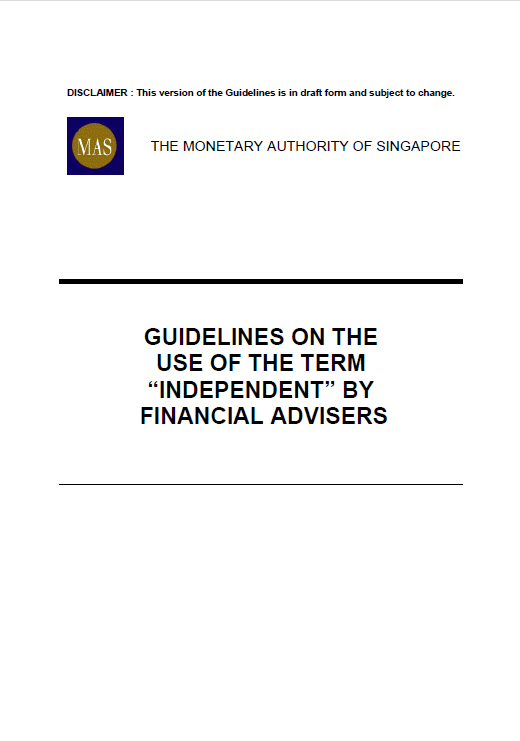 1.3 The purpose of these guidelines is to give guidance to financial advisers on the circumstances they may use the term “independent” in the name, description or title under which they carry on business in Singapore, promote or advertise their services, or use the term in respect of their advice or recommendation. (c) Operates without any conflicts of interest created by any connection to or association with product providers. 2.2 Regulation 34(2) of the FAR states that a financial adviser which is prohibited from using the word “independent” in the manner specified in Regulation 34(1) shall inform all of its representatives, in writing, of the prohibition. 3.5 A financial adviser is likely to be biased in favour of a particular product unless it receives a broadly similar level of commission for similar products or classes of products it recommends. This could also be the case if the level of commission received is similar, but the financial adviser receives significant other additional benefits, such as free research or training for recommending a particular product. 3.6 If there are any significant differences in the rate of commissions payable for different classes of products, such differences may create a bias in favour of the class of products that pay the higher commission. What is a significant difference is a question of fact in each case.